Jaimie is 8 months old! 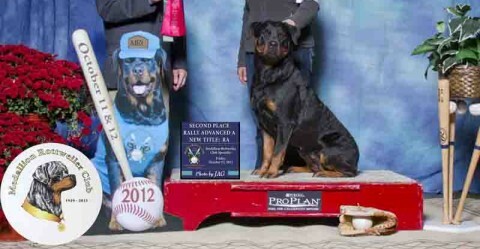 Last weekend we attended our first Sieger show held by Central Ontario Rottweiler Klub in Welland, Ontario, CA. We had alot of fun. Sad our friends couldn’t come with us, but happy to see a few friends we have made in CA when we go there…even made a few friends before the end of the event. This was Jaimie’s first show, first time ever in the company of so many people and dogs. He was overwhelmed. He barked alot, snarled alot, was on guard most of the time, dragged me around alot. At 90 lbs, it wasn’t hard to exhaust me by the end of the day. On the positive side – he walked into the ring like a good boy. Let me greet the judge and shake hands without a problem. Let me show his teeth without a whole lot of fuss, and let the judge examine his tail and boy parts without a problem. He also trotted around the ring when I took him around and stood for the visual exam. He didn’t bait well though as he was so overwhelmed. Just stood still and looked around. Still, he was a good boy and that was all I wanted for our first show. He received a nice critique by a very nice judge who I think sympathized with me and my squirrely puppy. He received a ‘Promising’ rating!